Recently, news broke that made-in-China dog jerky treats had killed about 600 pets (mostly dogs, along with almost a dozen cats) and made thousands more ill. Poor guys. The FDA's veterinary medicine chief, Dr. Bernadette Dunham, called it "One of the most elusive and mysterious outbreaks we've encountered." I hate that headline. I love my two cats, Lily Gorilla and Coco, who, I'm afraid, are pretty spoiled. (They occasionally score leftovers from the Food & Wine Test Kitchen and from restaurants around New York City.) Still, there are some lengths I'm not ready to go to, like paying $1,000 for treats. Here are some of the more extravagant things people are doing for their pets. And before my cats start feeling left out, I'll note that they're all geared toward dogs. If you're determined to feed your dog top-shelf ingredients, Organic Pet Boutique offers Kobe Beef and Truffle Jerky Treats for dogs. It's made-to-order. And costs $1,000. The upside: Shipping is free. And a percentage goes to the no–kill shelter Best Friends Animal Society. Dog-Gone Good Cuisine, by Gayle Pruitt (a nutritionist and chef), has more than 100 recipes, most of which can be served to both dogs and people, like Dirty Dog Rice, or Curried Beef Sliders on Gluten-Free Buns. 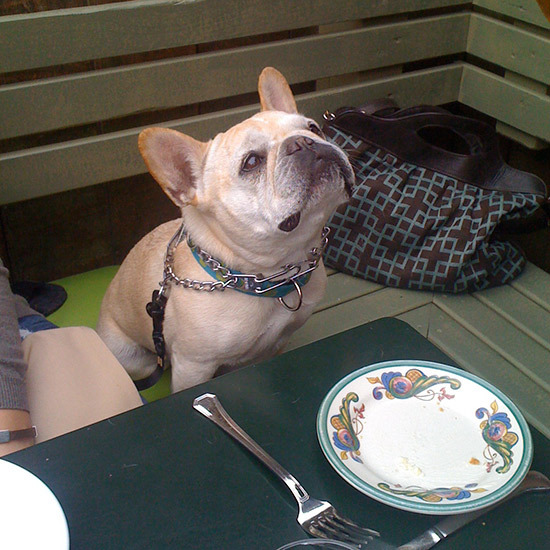 If you're into making special breakfasts for your pet, check out the recipe for Chia and Flaxseed Pancakes. There's also a smaller Canine-Only section that features raw food (i.e., raw grass-fed chuck roast with green beans and tomato sauce). The author does remind readers to "Always consult your veterinarian when using new ingredients." The book comes out in February. In November 2012, robbers made away with 20,000 pounds of Pet Chef Express dog food (valued at $35,000) from Atlanta's Intown Healthy Hound warehouse. They sneaked in through a window and removed pallets of dog food with a forklift. There were no security cameras or alarms on the property so the thieves were not caught. "We don't eat the same flavors every day, so why should our dogs?" asks the folks at Doggie Shotz. They're sympathetic to pets that might need nutritional supplements but want them to taste like cheeseburgers. So this gravy-like condiment comes in dog-friendly flavors including BBQ Baby Back Ribs, Bacon Cheeseburger, Bacon N Eggs, Chicken Stir Fry, Turkey N Mash, and 3 Cheese. But it's 90 percent fat free, and includes ingredients like fruit juice concentrate (to supply vitamins A, C and E) and carrot powder (for vitamins A, B6, B12 and C).